This was an interesting project. Our customer had their HVAC units vandalized for the copper and other metals and called us for a long term solution. During our discussion we learned that years ago the units were taken and they installed a chain link fence to protect the new units. Some time later they were taken again. This time they installed a 6 ft tall wood privacy fence. Again the fence worked for awhile and the units were vandalized again. 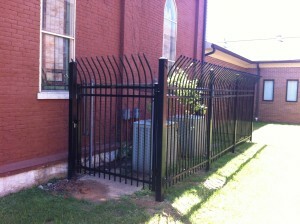 This ornamental steel fence will give the customer the security needed and the visibility they wanted. This is a industrial customer that prefers this concept in residential areas for good neighborhood relations. 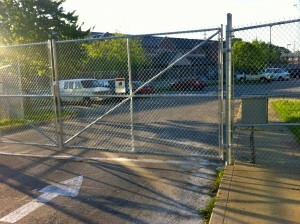 The fence is our traditional commercial / industrial security fence with 6 ft tall chain like fence with 3 strands of barbwire on top for a total fence height of 7 ft tall. 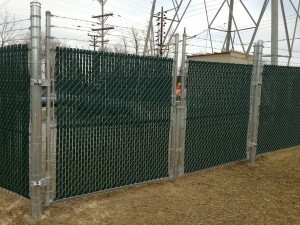 The green privacy slats provide for screening but not a total blackout of the items behind the fence. We do a good deal of work like this for all types of customers. Personally I believe in the work of the Salvation Army. I have seen first hand the work of these dedicated people and they have my admiration. So when Mike came in for a few fence fittings for one of their properties, I said consider it a donation and a thank you for the great work the Salvation Army does.